In the fast running world of computers and desktops, there are many parts of our body that are missing out on the needful exercises. The use of hand exercisers in our everyday routines shows impressive results in developing the strength and flexibility of the muscles around the hands and fingers. It is very important to eliminate the stiffness in our fingers that may have been caused by any given reason. Maybe, you have troubling fingers or looser grips that are bothering you. 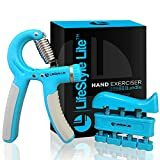 Hand exercisers make-up for the easiest method of enhancing the grip strength and eradicating any complications that may have occurred due to an injury, surgery or disease. 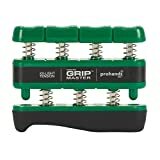 In this article, we have listed the best hand grip exercises and finger strengtheners that are available in the market and promise to reward you with results that you will always like. 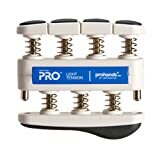 A simple and user-friendly design that has features aimed at providing you with optimal results in terms of strengthening your hand, fingers, wrists and arm muscles. Exercising on a finger exerciser helps in rewarding you with enhanced grip strength and hand function, making your day to day life easier. The anatomical design on the Rolyan Ultragrip helps in the correct positioning of the fingers and has a resistance of 3 pounds for better workouts. It also features a fingertip design that eradicates any chances of ineffective exercises and the presence of the extra notch in the center helps in keeping the thump in the right place. If you are looking to improve your gripping power and reward yourself with a stronger as well as better grip every single time, the professional hand grip exerciser from Gripmaster is undoubtedly one of the most trustworthy models in the market. Over the years, it has acquired a good amount of trust from professional fields like the DEA, ATF, and FBI for its amazing results. It uses the patented finger piston technology that is spring-loaded which focuses and challenges every single finger to readily improve the strength in your forearm, wrist as well as hand. The small design makes it easier to fit in the pockets, carry it around and have the luxury of exercising as per your convenience. If you are an athlete, rock climber, golfer, musician or an everyday man looking to have superior along with improved strength, power and speed in your hands as well as wrists, the Kootek is a reliable model for you. First and foremost, it has an ergonomic design that can serve any individual, man or woman, teen or old. Then it has a construction of durable rubber non-slip handles on the base that allows comfortable use. Furthermore, the use of premium quality materials and tension springs that are stainless steel combined with top-notch design ensures high-end functionality and durability. The dial can be adjusted in a range between 22 pounds to 88 pounds, allowing more flexibility. A durable model is always a better option as they can serve you for a longer period of time. The Lifestyle Lite grip strengthener is constructed out of ABS plastic and heavy-duty spring that promises to work without a glitch for long-term. The handgrip has a flexible resistance range between 22 pounds to 88 pounds, allowing both advanced and beginners to take its advantages. Furthermore, it is extremely silent so that you can help your hand muscles without any raised eyebrows from the people around you. The difficulty level can be adjusted by one turn of a knob as per your needs and it shows quite good results in recovery processes as well. Eliminate the stiffness in your fingers or any kind of pain due to arthritis with this reliable grip strengthener. The reliable and trustworthy name in the field of grip strengtheners, Gripmaster’s Pro Edition model is undoubtedly one of the most efficient and high-workability strengtheners in the market. The smart and innovative design is subjected to isolate and deliver effects in each finger individually for enhanced strength, endurance, deftness and dexterity. It also helps enthusiastic individuals who are on the lookout to attain and maintain strong hands on the longer run. The pocket-size design helps in carrying it around and takes its benefits anywhere, anytime. It is adjustable and the resistance can be altered in every individual finger for superior results. 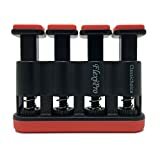 The finger strengthener is known to deliver a vast array of different tensions that help in improving the grip strength in fingers and can be adjusted in a range between 3.5 lbs to 6 lbs for extracting out the perfect results from each workout session. Moreover, the finger exerciser can be used by athletes, climbers as well as musicians for maximum results in terms of enhanced dexterity, mobility, and agility in the fingers and wrists. The base has a comfortable, soft rubber coat that makes it easier to use and the heavy duty durable plastic construction ensures the long-term running of the product. 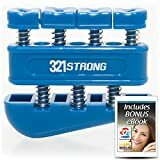 The 321Strong Finger strengthener is focused on rewarding your fingers with the grip and flexibility that you have been longing for. It is a sturdy grip strengthener that let’s all of your fingers gain individual strength. Often, after a surgery or an accident, some of your fingers lose the real power, but with proper exercising on the 321 Strong, you can gain the full power of any finger with ease. It has a design where you can adjust the resistance on each finger and even the thump and lower portion of your palm gets the required attention. Small, portable and totally silent, carry it to your workplace or classroom as well as exercise on it without even turning any attention towards you. ClassicChoice has developed this model keeping different athletes and musicians in mind. The innovation in the design ensures that every individual gets the superior results in energizing of the fingers without any risk of exhaustion. It is small and compact, making it easy to carry around even to your workplace and reward you with improved finger flexibility. The satisfying fit for every finger makes it comfortable and effortless to use. Plus, it has a resistance range between 2 lbs and 5 lbs so that you get the results what you are hoping for. 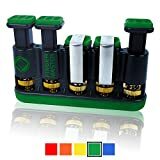 Furthermore, the grip strengthener enables you to adjust the pressure on each of the four fingers individually and the lightweight, compact design makes it more portable and flexible. The product making to the top of the list undoubtedly has gained the right amount of trust and attention over the years. Epitome Fitness Finger Master is a stupendous model that has taken the challenge for its competitors to a whole new dimension. Each of the five pistons on this grip enhancer can be manipulated as everyone’s finger set-up and need is not the same. The super compact, portable and convenient design allows you to have the best of finger exercises at any given point in time. Furthermore, it is constructed out of standout soft and malleable rubber for outstanding comfort and is combined with a copper core which promises to be more durable, flexible as well as smoother than the steel springs. Help your fingers, arms, elbows, and wrists gain and enhance flexibility, mobility plus strength with everyday use of the finger exerciser. Your fingers also require your undivided attention to be in the right shape and functionality and it is the time that you incorporate the use of a hand exerciser in your regime for seeing the impressive results.